PhilStockWorld.com | TGIF – Stop the Week – We Want to Get Off! TGIF – Stop the Week – We Want to Get Off! Well, you can't say we didn't see this coming. 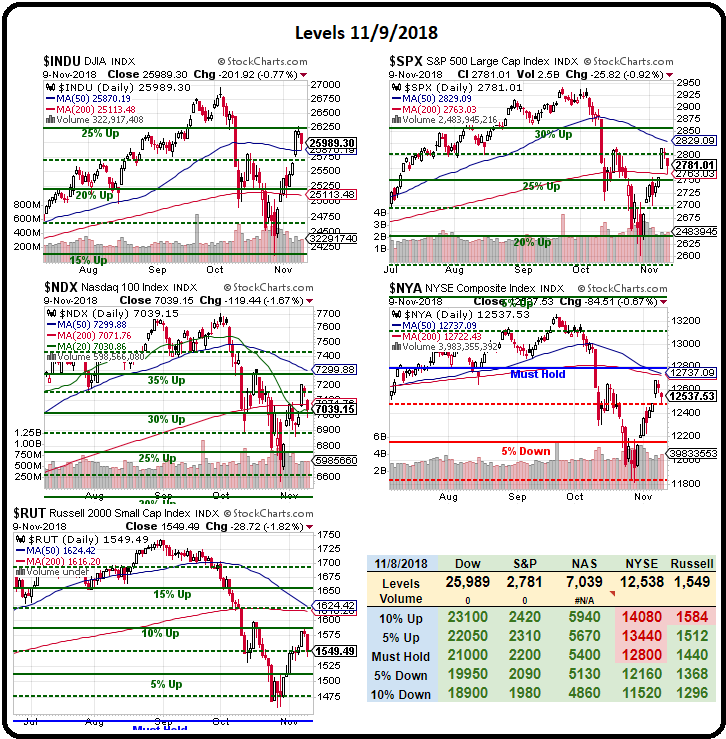 On the right is where we closed last Friday, just shy of 26,000 on the Dow, just shy of 2,800 on the S&P, 7,039 on the Nasdaq, 12,573 on the NYSe and 1,550 on the Russell. It may have seemed like we were recovering but this is why we have to ignore our instincts (bullish or bearish) and just watch the bounce lines according to our 5% Rule™ before making drastic changes to our portfolios. I had warned about being fooled by the bounces in Friday's Morning Report and on Monday we laid out our game plan for the week and I don't go over them to show how right we were but it's good to reveiw what we said then in retrospect so the next time we tell you what is likely to happen, you have better context for how our predictions play out. We went long on Gold (/YG) and Silver (/SI) Futures on Monday and that was BRILLIANT but we were way too early getting bullish on Oil (/CL) and Gasoline (/RB) though, fortunately, we did have a plan to lose "just" $420 at each nickel stop on the way down ($1.65, $1.60 and $1.55) as we played for the eventual turn. As it stands now, we're long 4 /RB contracts at $1.55 after losing $420 on the first penny at $1.64 and then $840 (2 contracts) at $1.60 but now 4 contracts at $1.55 seem to be working and we're back to $1.585 with a $1,470 gain and, of course, we are taking 3 off the table, leaving us with just the original one long contract at the much better price of $1.55 while we're up net $210 overall on the closed contracts. http://welcome.philstockworld.com/wp-content/uploads/2015/09/PSW-Adooma-logo.png 0 0 Phil http://welcome.philstockworld.com/wp-content/uploads/2015/09/PSW-Adooma-logo.png Phil2018-11-16 13:27:312018-11-16 13:27:31TGIF – Stop the Week – We Want to Get Off!